This is always a crazy point for Kevin and I. I’m not sure why, but it is. For years we traveled to his family and mine for both Thanksgiving and Christmas. Eventually, after a few harrowing trips, we decided to do one family for each holiday. That seemed to work well. This year, we each went to our own family for Thanksgiving and stayed home together for Christmas. The first big question we had for each-other was, do we get a tree. 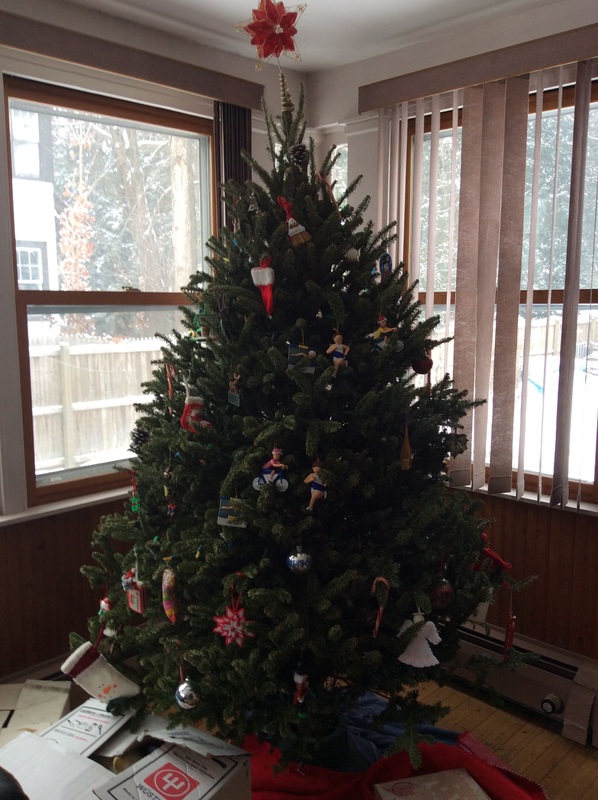 After moving to Saranac Lake, I began to set up a tree each year. I’m not sure why. I had no presents, no one to see it. But for three years I set one up, decorated it, and celebrated the holidays. I didn’t think about it at the time. It was just something we did. The first year Kevin and I lived together, we got a tree. It resulted in a ton of chaos; where to put it, who would water it, vacuum around it, etc… We got one from a fund-raiser at school and put it up. The first night we awoke to cats crying and found both of them trapped in the tree. The tree had fallen onto the TV and made a HUGE mess. We continued to care for the tree but agreed that for the next few years we wouldn’t get one. We came up with excuses for why not to have a tree–we would have to clean it up. We would have to buy it. Why did we want a dead tree in the house. 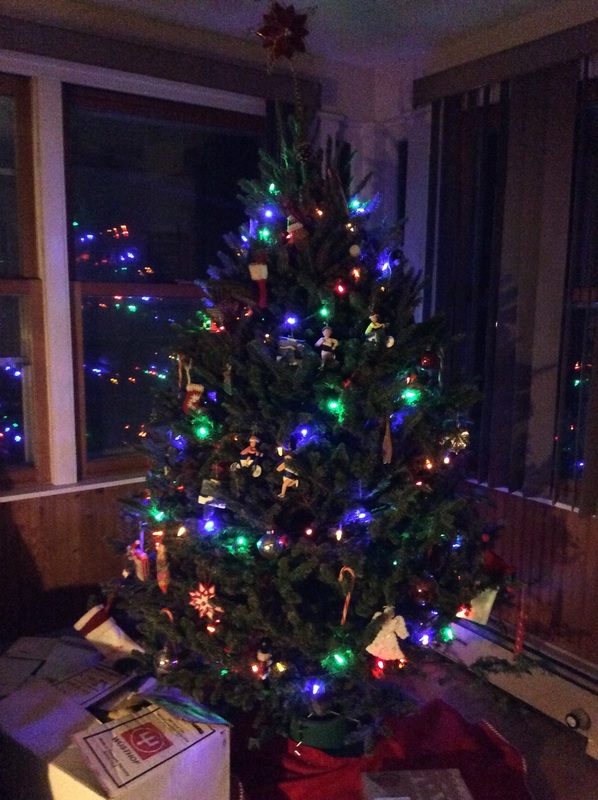 Well–staying home this year and over five years after our last tree incident we decided to give it another go. From the first moments-it was awesome. We pulled up to Ace and bamm–two trees in we found one. I am still thankful Cam gave us a hand. He cut the bottom branches off and I’m still convinced that he cut us a bit of a deal based on the cash we had. Thirty minutes later the tree was standing in our house, straight, and was relaxing. I had never really understood the purpose of the tree until this year. This tree gave us a reason to take out our ornaments. Previously I had just placed them on the tree smiling here and there over them. This year when we placed them on the tree we discussed where each had come from. It brought back amazing memories of Cynthia, my uncle Bill’s mother, who would make us ornaments such as a reindeer that still plays to a chalk board, a tree, a sled, etc… Cynthia passed away years ago I am now so thankful to have the memories of her. We have ornaments my parents and grandparents gave us. Kevin’s mom got us triathlon ornaments that are cute (one for each sport), we had some snowshoes that were from a race we did, and I had the items from Diane Mehrman who was once my secret santa (beautiful silver leaves). Had we been drinking while we were doing this I would have contributed the nostalgia to the alcohol. However, we were stone sober. We shared past time stories about how our families prepared for the holiday and decorated. We talked about the traditions with hanging the ornaments and how we wanted to attack that (his/hers halfs; by theme). In the end, we carefully placed each ornament in a spot that seemed appropriate. In the end, we had a most beautiful tree. And–this time our tree resulted in no chaos. It stood, undisturbed by the cats. During the next few weeks we would gaze and discuss the tree, revisiting our childhood memories. We placed various items under it, just so it didn’t look bare. But most importantly-it gave us a chance to revisit the past. The influences and memories from childhood. The caring spirits who truly understood the importance of a holiday ornament, the sentiment that they would bring. As we got this one outside it made me think, I can only imagine we will have one next year too. We go away every year for a week or so at Christmas but I still put a tree up. I love coming home from working and putting the lights on. I also love the smell. It makes me so happy. I also love the day that we go get it and put it up. Usually Tom just sits there but we put on cheesey xmas shows and drink while putting up the decorations…. i look forward to it every year. I was just thinking this morning about when Tom will makw me take it down 🙂 . I usually hold out as long as I can.